*Essence Merry Berry Nail Polish in 02 Purple With Purpose: A stunning satin finish deep royal purple shade. *Essence Merry Berry Eyeshadow in 02 The Masked Ball: A purple eyeshadow with taupe shades and glitter undertones. The eyeshadow is pretty powdery and you get a lot of fall out. *Essence Merry Berry Eyeshadow in 01 The Perfect Dress: A shimmery beige eyeshadow with glitter undertones. It looks beautiful and natural on the eyelids. 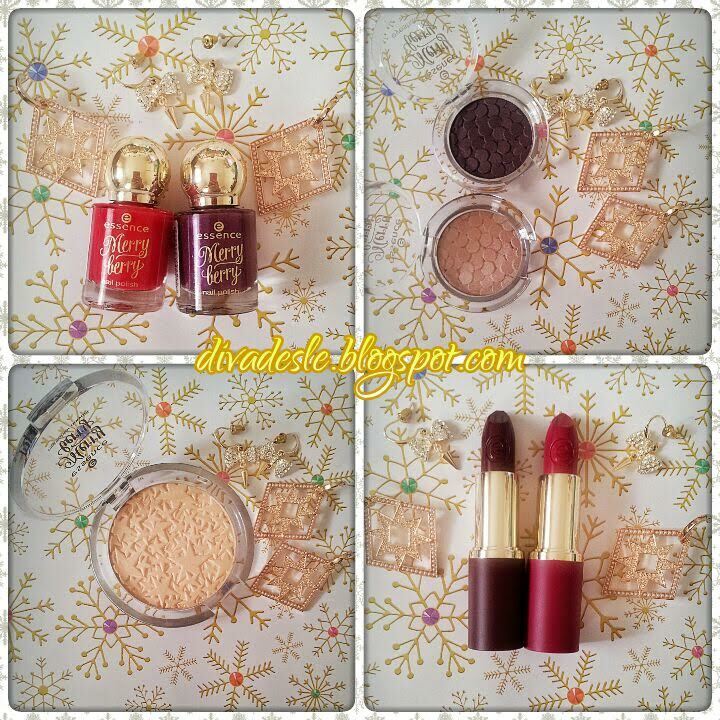 *Essence Merry Berry Highlighter in 01 I love My Golden Pumps: A glowing gold highlighter that gives a natural luminous glow on the cheeks. *Essence Merry Berry Lipstick in 01 Let's The Berry Tales Begin: A plum lipstick shade with berry undertones. It looks very sultry on the lips and great for a romantic night out. *Essence Merry Berry Lipstick in 02 Pink and Perfect: A bright pink and berry shade which is very festive and playful. You could wear it any time of the day and it would transform any makeup look into a pretty whimsical feel. I am absolutely in love with the highlight powder, shimmery beige eyeshadow shade in The Perfect Dress, Let's The Berry Tales Begin plum lipstick and the nail polish in Purple With Purpose. In my opinion these are the best products out of the collection. The highlighter is very natural. I love to use it on my cheekbones and under my brow bone. You can really build up the shine and there are no glitter chunks which I love. The beige eyeshadow makes the eyelids pop without being over the top. The plum lipstick and purple nail polish are unique shades that I do not own in my makeup collection. The other red berry lipstick and nail polish are pretty but they are not unique in shades. So if you have something similar in your makeup kit you honestly don't need it. The purple eyeshadow in The Masked Ball is my least favourite product I bought. The eyeshadow has a lot of fall out and you truly need an excellent sticky primer to make the eyeshadow stick to the eyes. You can definitely skip that eyeshadow if you are looking to pick up only a few pieces from the Merry Berry range. In the photo above I painted my nails with the Red Rocks and Purple With Purpose nail polishes. The nail varnishes are very opaque and have a beautiful shine after applying a top coat. They dry quite quickly which makes nail painting a breeze. I really love how this manicure turned out. I think it looks very pretty. On my face I applied the eyeshadows, highlight powder and lipsticks. I think both lipstick shades compliments the eye look so well. Look at the magnificent highlighter on my cheeks too! I just love it ;-) If you only want to pick up one thing from the range you have to buy the highlight powder. The stunning starry packaging alone makes my heart skip several beats. That has to be the cutest Christmas Collection. I love reds and berry color lipsticks Desle. Your nail art is divine! I'm a little obsessed with the highlighting powder as well as the hair mist. Super cute post! This collection is gorgeous! I am so annoyed we didn't get it here! Yes the highlighting powder is totally awesome ! I love the Pink & Perfect nail polish and the hair fragrance - that totally rocks ! This is my favourite collection from Essence yet. I got all of the lippies, the scented hair spray & golden spray and one polish in the masked ball. I haven't loved any of their other collections as this one. I've looked for some of these items and can't seem to find it. is there a specific branch I could go to? Thank you for the awesome posts, I'm keen to try this range out too.